SOS-LIFE Earthquake early warning system. Quake Alarm. Earth Quake detector. - Digital equipment, independent from any other source, equipped with an alarm, in case a major earthquake occurs. - Has the possibility to manually activate a switch for sending of International SOS distress signals (an acoustic SOS signal), if the user is under ruins of a crashed building due to a major earthquake. - For extreme situations, the earthquake early warning device is equipped with rechargeable batteries. - Different colored lights, indicating the following statuses: "Earthquake Alarm" , "OK Status" and "Low Battery " . - Very powerful (Loud) imminent earthquake warning alarm (85 dB). - The SOS-LIFE earth quake early warning system is equipped with a string, making the device's transportation accessible upon a person, in case of a major earth quake. P Wave - Comes first at the destination surface point, being harmless. S Wave - Comes second, and it's destructive upon buildings. R Wave - Comes third, being as destructive as the second. - The quake alarm continously monitors the surrounding environment, in search of an earthquake's initial P waves. - When the quake alarm has detected a P wave ( representing the warning of a future imminient major earthquake), the visual and acoustic quake alarm will start. - The SOS-LIFE earth quake early warning device, alarms you 30-60 seconds before an earthquake occurs, depending on the seismic epicenter, hipocenter depth and the distance at which you are situated from the seismic epicenter, earth composition etc. - Alarm : 85 dB at a distance of 1 m.
- Dimensions: width: 8,5 cm. ; length: 4 cm. ; depth: 14,5 cm. - Power usage: 120 mA max. - Battery Life : in case of emergencies, the batteries last 7 days, since the quake has occured. 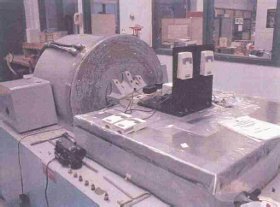 - The devices manufactured by SOS-LIFE N.V., have been thoroughly tested, in extreme conditions (picture), by the National Center for Research on Earthquake Engineering (NCREE), being properly configured, to sound the alarm when an earthquake of a minimum 5,3° Richter scale , happens. SOS-LIFE earthquake early warning devices, come preconfigured especially for different area's earthquake topology. Customers have the possibility to order the earthquake alarms, with their desired sensitivity of the detection level, depending on the building seismic risk, where the device will be installed. This configuration can be made only at the SOS-LIFE manufacturer factory, being made on a professional earthquake evaluation scale, equivalent and reported to the correspondent level of magnitude on the Richter scale. An earthquake can be devastating, if the proper anti-seismic measures and precautions are not undertaken. Ex. If the building is new, and it has an anti-seismic strong structure, you could install a device configured to detect an earthquake with a greater magnitude than 6,0 - 6,5 degrees on Richter scale. The installation of the optimum configured earthquake early warning device, avoids futile emotions, if an earthquake occurs, that can not affect the structure of the building you are in. Earthquakes, if analyzed properly, can actually give warning of their incipient occurrence, even before the ground starts shaking heavily. A critical objective is to quickly identify the precursors of the destructive waves of the earthquake in time to initiate an alarm. SOS-LIFE is a unique digital earthquake early warning alarm that can quickly and reliably identify the precursors that precede every earthquake. The unit continuously monitors your surrounding for these precursors. When it detects a precursor, expected to be followed up by a major earthquake, the unit will alarm instantly. SOS-LIFE uses a combination of the latest sensing hardware and specially developed - state of the art – software. Although the exact warning time varies for every earthquake as this is depending on several variables, so as the distance from the epicenter, soil conditions, depth of the earthquake etc, warning time can reach up to 60 seconds. This might not seem like a long time, but in just seconds occupants could wake up their children and find a safe location, away from sharp and heavy objects that could injure them! SOS-LIFE can be compared with a smoke detector: The unit senses danger which already occurred, but the warning time might still be enough to reach a safe location. SOS-LIFE is especially designed for use in single private households and small offices. The unit can be attached to the wall (in the office, bedroom or staircase) and it will give a loud acoustic (85 dB) and visual (red blinking LED’s) alarm. SOS-LIFE is a scientifically tested and approved system. When an earthquake occurs, energy radiates outward in all directions. The energy travels through and around the earth as three types of seismic waves called primary, secondary, and surface waves (P-wave, S-wave and Surface-waves). All various types of earthquakes follow this pattern. At a given distance from the epicenter, first the P-wave arrives, then the S-wave, both of which have such small energies that they are mostly not threatening. Finally, the surface waves arrive with all of their damaging energies (Figure 3). It is predominantly the surface waves that we would notice as the earthquake. This knowledge, that preceding any destructive earthquake there are telltale P-waves, are used by SOS-LIFE to reliably initiate an alarm before the arrival of the destructive waves. 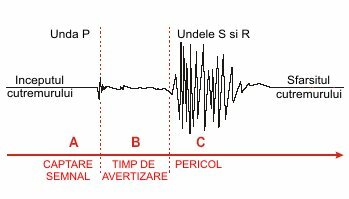 The fastest kind of seismic wave is the P-wave and always arrives firstly at your house. 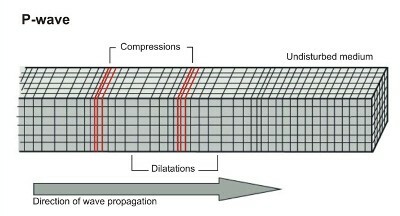 P-waves typically travel 1.68 times faster than S-waves and 2 to 3 times faster than the Surface-waves, which typically travel at about 3.7 km/s. Thus there is typically a one-second separation between the P- and S-waves for every 8 km traveled. S-waves travel about 4 km/s faster than surface waves, so every 4 km away from the epicenter typically adds one extra second of delay between the P-S complex and the arrival of the Surface-waves. The P-wave can move through solid rock and fluids, like water or the liquid layers of the earth. It pushes and pulls the rock and moves through just like sound waves push and pull the air. Have you ever heard a big clap of thunder and heard the windows rattle at the same time? 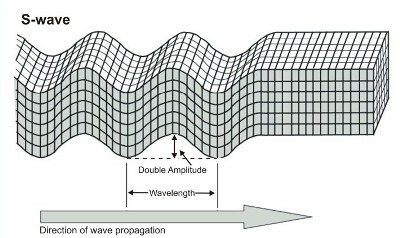 The windows rattle because the sound waves push and pull on the window glass, much like P-waves push and pull on rock. Although potentially part of a large earthquake, usually we do not feel much of these waves and they are not dangerous. After an earthquake many times people have reported that their animals behaved unusually just before the earthquake stroke. They believe their animals were able to predict the earthquake. In fact, some animals can sense the harmless P-waves and express the coming danger with unusual behaviour. SOS-LIFE uses rapidly responding sensors and digital signal processors in combination with reliable “P-wave recognition software”, based on real earthquake data from various earthquakes, to identify the P-wave and immediately initiate an alarm. The SOS-LIFE unit will only alarm when a major earthquake threatens to occur. The unit will not respond to normal trembling, caused by heavy trucks, slamming doors, playing children etc. The SOS-LIFE system is extensively tested by independent earthquake research institutes worldwide. Secondary waves (also referred to as shear waves) can travel through solids, but unlike P-waves they cannot travel through liquids. The energy of an S-wave travels through the earth as a sequence of up-and-down vibrations perpendicular to the surface of the earth. Its passage causes particles to vibrate in all directions, North-South and East-West. Its velocity is between that of P-waves and that of Surface-waves. Surface waves are the slowest and by far the most destructive of the three types of seismic waves. 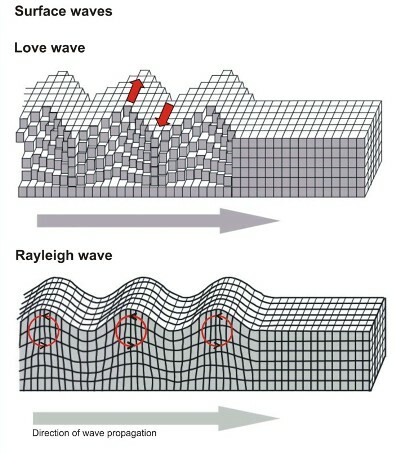 Surface waves travel along the surface of the earth as two types of waves: Love waves are the fastest surface waves and move the ground from side-to-side, while Rayleigh waves (R-waves) roll along the ground just like a wave rolls across a lake or an ocean. Because it rolls, it moves the ground up and down, and side-to-side in the same direction that the wave is moving. Most of the shaking felt from an earthquake is due to the R-wave, which can be much larger than the other waves. The motion of seismic movements exposed to the unit are measured promptly, and accurately by a high sensitivity and fast-responding built-in accelerometer. The out coming data produced by the accelerometer is processed continuously and filtered in order to remove noise. While continuously monitoring the accelerometer out coming data, an unusually large acceleration disturbance is identified, and labelled as a possible P-wave. The system’s P-wave recognition algorithms instantly calculate whether a potentially life threatening earthquake can be expected to follow up. If the movement pattern does not correspond with an earthquake pattern, the system shrugs it off as a false alarm. 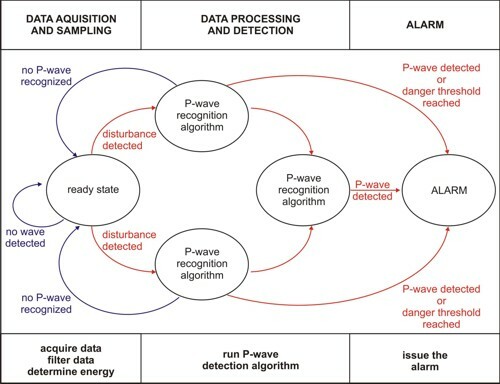 It is because of the accuracy of the P-wave recognition algorithms that the detection system can filter out extraneous noise, such as might be produced by large trucks, rock blasting, slamming doors etc. If, on the other hand, an earthquake pattern does show up, the detection system immediately actuates the alarm. The alarm could be issued within less than a few milliseconds after the presence of a P-wave is verified. All channels of the accelerometer are processed separately and during the calculation process of the first identified large acceleration disturbance, a second processing unit is already waiting to identify a following seismic movement. Find more information about potential customers, applicability, utility and advantages of the SOS-LIFE Earthquake early warning device. Moreover you can see the Personal Safety Pod , our new S.U.P.E.R SHELTER ( Safe-Use Personal Emergency Rescue Shelter ), wich, after the warning device signal, will protect your life in case of earthquakes , tornados , hurricanes , terrorist attacks , war actions .